Cover of MARVEL ADVENTURES: HULK #12. In this issue, our hero teams up with the Thing, Juggernaut, and Doc Samson for some good old-fashioned gladitorial smash-iness. I can't get enough when I see my favorite big guys working together. Hulk, Thing and Juggernaut working together. I love it. apologize for commenting so late. I appreciate comments whenever they come in--thanks for yours! I haven't seen such a beautifully massive team up outside of myself of Hulk, Thing and Juggernaut. I'd love to find more team ups of these tremendously built and monumentally powerful men. Including others who are just as big. You did a magnificent, grateful and encouraging job. its times like that you have to accept that you are totally and udderly screwed! Seriously. Any one of those guys would be trouble. no i mean if you had to fight all four of them. I hear ya, but I think you might be screwed against any ONE of them, unless you're Thor maybe. 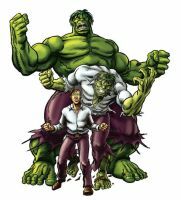 thor can barely handly Juggernaut let alone hulk, thing and doc samson together. See, if THIS was the warbound in Planet Hulk, everyone would be SCREWED by World War Hulk. So awesome I actually bought the comics! And it's GREAT to see the artworks without the obscuring text of the title page. Sweet!! Hope you enjoyed the comics. Lol damn. That place must be pretty strong to contain all those suckers! Seriously. Who the heck lasts 5 minutes with a team like that? I love this take on Thing, David. Great cover. whoa! nice perspective! very intense action! Wow, this one is awesome..love your hulk and thing!! u can post our alice cover now btw. Sweet! I'll go do that right now. Talk about a team of powerhouses...someone's going to get hurt. Bad. this looks like a winner!!! I'm actually not sure who they're supposed to fight in this issue, but good luck anyway! Oh hey, I just picked up Sheena #5 with your cover... Great work David!!! Thanks! I've still gotta go in to get one for myself. I like your version of the Thing! A titanic team if ever there was one. Great work! I'm really digging your take on...well, EVERYONE! Workin' on a store site right now. They're a collection of 'big guy' characters that Hulk's encountered over the last few issues. Wow, now there's a powerhouse team!